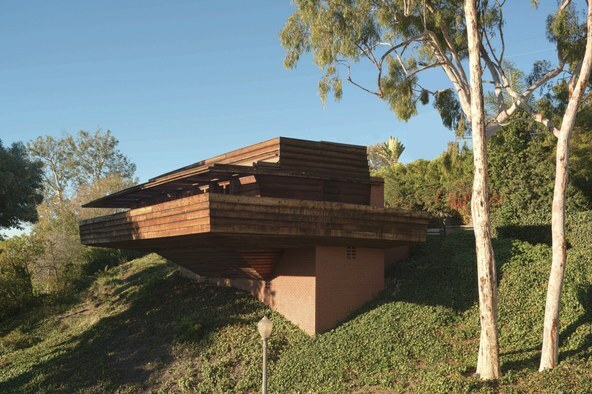 A 1,200-square-foot Brentwood home designed by Frank Lloyd Wright in 1939, and built under the supervision of John Lautner, will be auctioned off on February 21. DnA talks to Los Angeles Modern Auctions founder Peter Loughrey. The first item he sold, 24 years ago: a Frank Lloyd Wright window. Now he’s getting to sell an entire house by the famed architect. The music that concluded the segment about the Sturges House was from Light Screens (2002) a composition scored for flute, violin, viola, piano, and cello by Andrew Norman. It was inspired by Frank Lloyd Wright’s stained glass window designs, which the architect termed "light screens." What Kind of Change Will the NFL Stadium Bring to Inglewood?